When done well, with concern for being as historically correct as possible, the French Poilu impression may at first seem outlandishly expensive, costing around $1,500+ for a basic impression and around $2,000+ for the more complete impression. However, a common point we like to raise with those who gasp at these prices is that by comparison the Poilu impression does not cost much more than well-made uniforms and equipment from other reenacted historical periods. The M15 Capote (double-breasted overcoat) will likely be the most expensive item you purchase for this impression, but its cost is only slightly above that of a well-made frock coat from another period, and perhaps less expensive than the more ornate coats used in earlier periods. As mentioned elsewhere, the 18e has loaner gear available for those who are interested in attending an event with us, and for those members who have not yet completed their own impression. 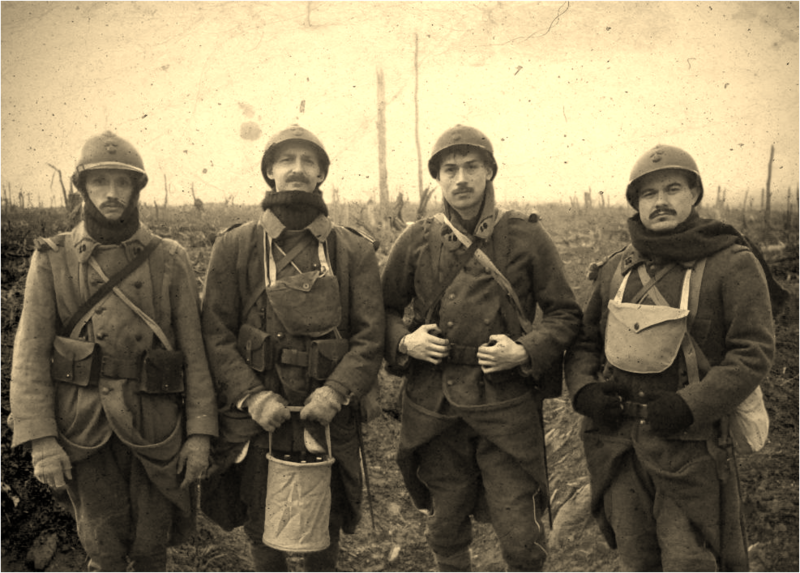 While the members of the 18e understand that the Poilu impression can take sometime to compile, new members are encouraged to demonstrate their sincere intent to gather their own kit over time. The list below is meant to provide interested recruits with one possible route to acquiring their basic Poilu uniform and equipment. Veteran members of the unit will provide guidance on what to buy and when throughout the entire process. ​The first item that a new Poilu is expected to get is a good pair of boots. Boots are the most difficult item to loan out. Currently, the best option for well-made French boots is Mattimore Harness. The M17 boot is the preferred boot for the GWA tacticals as these are 'late-war' (1917-1918) events; however, Mattimore also offers the 1893 and 1915 variants of the boots if you choose to pursue the earlier Poilu impressions. Mattimore's boots cost $235, but they are worth the money as they are better made and will not have to be replaced as often. We put considerable strain and wear on our boots, and while cheaper boots are available, they are not as likely to last as long. ​The next items you will want to get will be your drawers, shirt(s), socks and other undergarments or personal items. Efforts are underway to produce our own issued shirts, but there are others available online that (after a little mending) work well for this impression. Socks should be wool, and can be in a variety of colors, though the Poilu were often issued white or grey wool socks. Many new members use items from other periods for their first events. As long as they are made of the correct material and match either issue or civilian patterns and materials, they are generally accepted. That said, it is always best to check with members before purchasing or planning to use anything. ​Once a new member is committed to the unit and prepared to start compiling his uniform, he is encouraged to place an order with a member of the unit who is making top-grade jackets, overcoats, trousers, and caps. These items take time to make, so you will want to plan ahead and order well in advance of when you need your uniform next. Again, loaner gear is available for those who are waiting on items. Cheaper but acceptable reproductions of the M15 Adrian Helmet are now available online. Original helmets can also be bought from a number of sources and restored either by yourself or by a member of the unit. There are few sources for the leather accouterments, bread bags, and M2 gas masks at this time, and where you get yours will depend on which of these is able to take your order at the time. These too can take some time to make and ship. Puttees, among other things, can be gotten from Nice Collection. Once a new member has compiled their basic impression, consisting of a helmet, full uniform (including puttees), boots, accouterments, canteen, mess kit, and bread bags, they are encouraged to procure their rifle. As mentioned before, the M1886/93 Lebel and M1907/15 Berthier are preferred, and the M1907/15/16 or M1916 Berthier is definitely accepted, though limited to the late-war events only. Topping the list of the secondary items members are encouraged to get after completing their basic kit is a blanket. A founding member of the French Battalion recently sponsored a run of reproduction issue blankets, and members are encouraged to get their blanket(s) through the Battalion. Other secondary items include a havresac (knapsack), shelter half, entrenching tools, &c.
Finally, you will want to acquire some cold-weather garments. A wide range of knit garments (socks, sweaters, scarves, caps, &c.) can be purchased by order from Sarah Nichols at World War Knits.